When an earthquake strikes, the initial impact isn’t always the most devastating. Often, it’s the aftershocks that leave a destructive, lasting impact. The 7.8-magnitute earthquake that struck Nepal in 2015 affected nearly 8 million people, destroying thousands of homes and leaving an already remote country in critical need of support. But hundreds of aftershocks — some with magnitudes greater than 6.0 — ensnared every aspect of Nepalese life for months. Roads became impossible to traverse, businesses crumbled, and nearly 9,000 schools were destroyed or damaged. Since then, only a third of those schools have been rebuilt. Many of Nepal’s students have access to education through the support of organizations like Save the Children and Cisco Networking Academy, but for many, attending school in a physical classroom is still a challenge. Long before a 2017 research trip to Gorkha, Nepal, Soraya Fouladi imagined an idea to make education accessible for people around the world. She followed a path to make her vision a reality by pursing a degree in electrical engineering, working jobs in education, learning business management and sales, and studying international development. In 2016, Soraya’s career path led her to create the Jara Unit, a low-cost, personal crank and solar powered tablet that teaches geographically customized education to refugees and students in disaster or conflict regions. 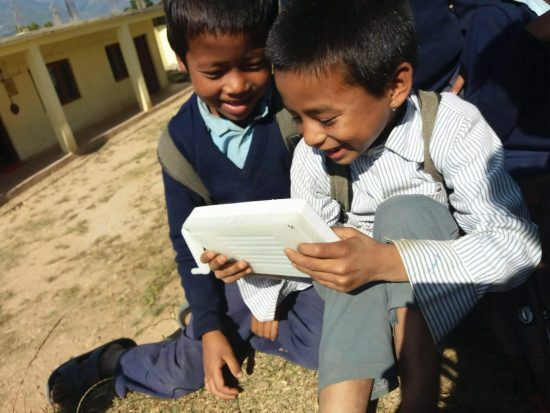 The CEO traveled to Nepal in 2017 to further learn about the problem affecting so many students and how their technology could serve as a solution. When she landed in Nepal, Soraya saw firsthand the critical need for a low-cost, IoT-enabled device like Jara. She discovered that many students were still attending temporary learning centers three years after the initial earthquake; that only one in eight of the schools they visited had electricity; and that none of the rural schools on their trip had Wi-Fi or reliable access to the Internet. “For so many people, especially young people and young girls, they have to fear for their future because the quality of the education they have today is very low or non-existent,” Soraya said. The students she spoke with simply wanted access to more information, and Jara’s IoT-enabled device is a door to the education they desired. It fills the gap left by a lack of physical classrooms, bringing tailored education to students in a way that empowers communities to rebuild, despite their circumstances. The word ‘Jara’ actually means ‘root’ in the Nepali language, and this mindset is at the core of the team’s work. The educational tools included as part of the Jara Unit extend beyond traditional math, science, and language courses. Fouladi and her colleague Mara Ohorodnik, who has extensive experience in the international education space, combined their years of knowledge to provide students with practical curriculum, from how to build a clean water system to applying for micro-loans. With a prototype in place and an expansive team that includes a board of advisors, Fouladi and Ohorodnik entered Cisco’s 2018 Global Problem Solver Challenge, an annual competition that recognizes young entrepreneurs who are developing innovative, technology-based solutions and services that have the ability to change the world. While almost 300 teams competed for a total of US$300K in prizes, Jara’s innovation succeeded in capturing the attention of the panel of judges, who awarded Jara the first runner-up prize of US$75K. Cisco is proud to support teams of innovators working to create lasting social impact, and we look forward to working with Jara to help spread the roots of their innovation.